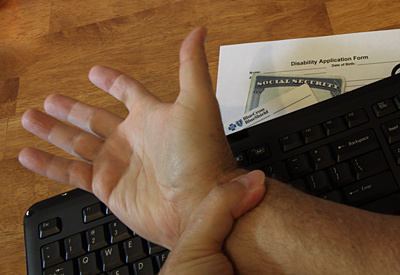 If you have Carpal Tunnel Syndrome and cannot work, you may qualify for disability benefits. Carpal Tunnel Syndrome is a painful condition that causes burning, tingling, or itchy sensations in the palm of the hand and fingers. Carpal tunnel is caused by pressure on the median nerve in the wrist. Symptoms are generally more prominent at night as most people sleep with their wrists bent. Carpal tunnel is not listed in the SSA blue book but often qualifies as a disability. If it prevents you from working, you may be eligible for Social Security or Long Term disability benefits. Severe carpal tunnel causes weakness in grip strength. This can make it difficult for people to pick up objects, open doors, or write with a pen. Smaller objects in particular can become difficult to grasp and hold. Additionally, carpal tunnel can cause loss of sensation in the affected hand. Some people with carpal tunnel cannot tell the difference between hot and cold water. Carpal tunnel syndrome is a repetitive stress disorder, meaning it is caused by continuous over-exertion. People spend a lot of time at their jobs, so occupation is a major risk factor in carpal tunnel. 67% of carpal tunnel cases are work-related. The idea that typing and computer use causes carpal tunnel is prevalent in pop culture. About 10% of those who use computers regularly at work complain of symptoms of carpal tunnel compared to 8% of all workers. While the repetitive wrist motions associated with using a mouse and keyboard can lead to nerve damage, carpal tunnel is more frequent among those whose professions are more physically demanding. Carpenters, bricklayers, and people who work in packing and shipping are all at risk for carpal tunnel. Moving heavy objects and working with vibrating tools is more likely to cause nerve damage than typing and clicking. There are several other factors that can lead to carpal tunnel. Inflammation and water retention in the wrist can cause abnormal movement patterns which lead to carpal tunnel. Most commonly, rheumatoid arthritis causes inflammation which can lead to carpal tunnel. Pregnancy causes hormonal changes and water retention which can cause the wrist to move improperly. Obesity can also lead to fluid retention and the risk is compounded by extra weight. Additionally, an injury to the wrist could lead to damage of the median nerve. Almost all jobs require hand movements and the ability to pick up objects. It is easy to see how it would be impossible to work with a severe case of carpal tunnel. If you have CTS and cannot work call 512-454-4000 for help. Carpal tunnel can be very difficult to treat. Many treatment options can only temporarily relieve symptoms. Most commonly, anti-inflammatory drugs and diuretics are used to help reduce water retention and swelling. Stretching exercises, good posture, and ergonomic devices can also help reduce symptoms of carpal tunnel. Surgery is often used to relieve severe cases of carpal tunnel. In fact, carpal tunnel surgery is one of the most common surgeries performed. Unfortunately, surgical treatment is often ineffective- only 23% of those who undergo the surgery return to their previous jobs. Carpal tunnel is not specifically listed in the blue book but often qualifies as a disability. The Social Security Administration defines a disability as the inability to engage in substantial gainful activity. Carpal tunnel prevents full range of motion in the wrists and can make it difficult to pick up objects. Almost all jobs require hand movements and the ability to pick up objects. It is easy to see how it would be impossible to work with a severe case of carpal tunnel. If you have carpal tunnel and it prevents you from working, you may be eligible for Social Security Disability Insurance or Long Term Disability Insurance. Most initial claims are denied. Applying and appealing either Social Security or Long Term Disability can be strenuous process. Whether you are dealing with a government bureaucracy or an unscrupulous insurance agency, the attorneys at Bemis, Roach and Reed have the knowledge and experience needed to advance your case. Call today for free consultation. Call 512-454-4000 and get help NOW.